Thymes Goldleaf is an everyday indulgence inspiring visions of classic femininity and grace. Smooth jasmine, fragrant roses, hyacinth and creamy lily of the valley blossom on a background of oak moss and musk to create a tapestry for the senses. Enhanced with the skin-soothing properties of nature’s most luxuriant ingredients, Goldleaf leaves your skin nourished, hydrated and softly scented. 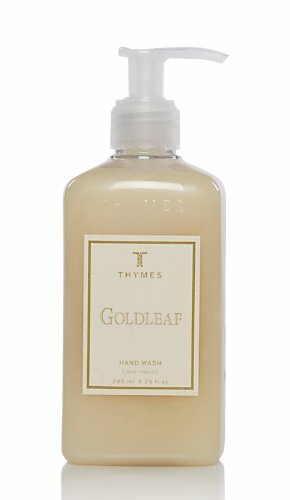 The creamy lather of Goldleaf Hand Wash caresses skin with gentle cleansing, leaving hands softly scented with the feminine tapestry of Thymes Goldleaf, a fragrance of smooth jasmine, fragrant roses, hyacinth and creamy lily of the valley blossom on a background of oak moss and musk.